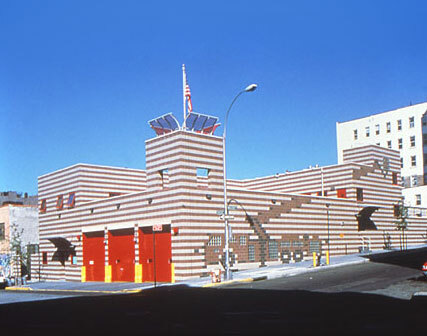 New Construction, Monumental Masonry for FDNY. New construction on a tight sight that required rock trenching. 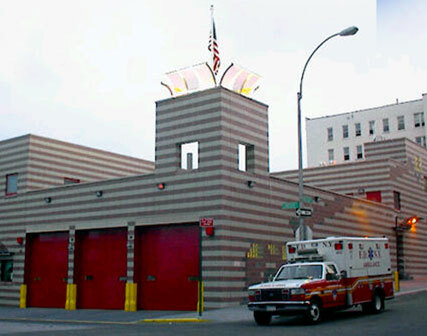 Engine Company 75 consisted of a 13,000 sq. ft. new combination steel and masonry bearing concrete plank structure with multiple roof levels and hose tower. Interior work consisted of masonry, acoustical and drywall ceilings, specialty flooring, finishes, security windows and screening, lockers, and food service equipment. Exterior finished masonry was with combination of ground face block and custom engraved glazed block to depict a LADDER TRUCK TO MEMORIALIZE FALLEN FIRE FIGHTERS.